« A very long post about beds, figurative language, feminism, and a piano. 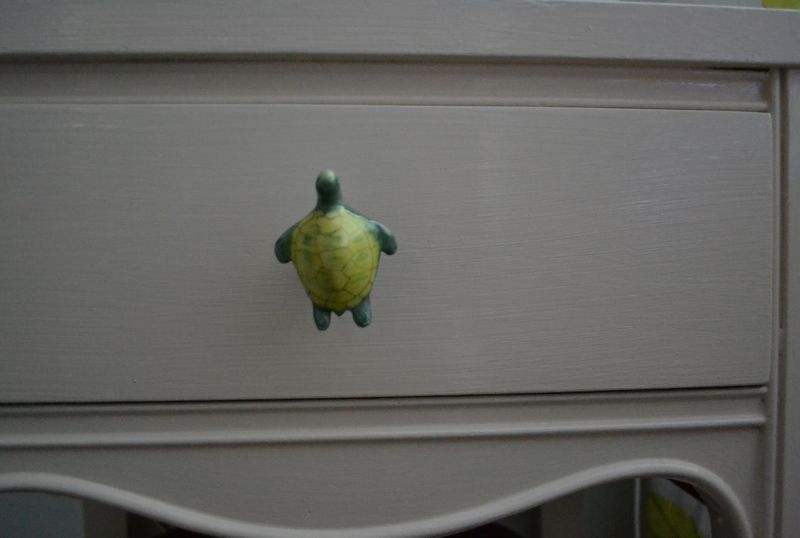 Wood putty, celery paint, and a drawer pull shaped like a turtle. I’ve been waging war against my basement ever since I moved into this house five years ago. Things have gotten better over the years; it has certainly never been as bad again as it was right after I closed on the house and discovered that the vibrations from our footsteps were causing dormant flea eggs—left behind by the previous owner and/or her one-eyed chihuahua—to hatch in staggering numbers. The cats, bathed in pesticides, were the only mammals who didn’t have fleas for that first month. 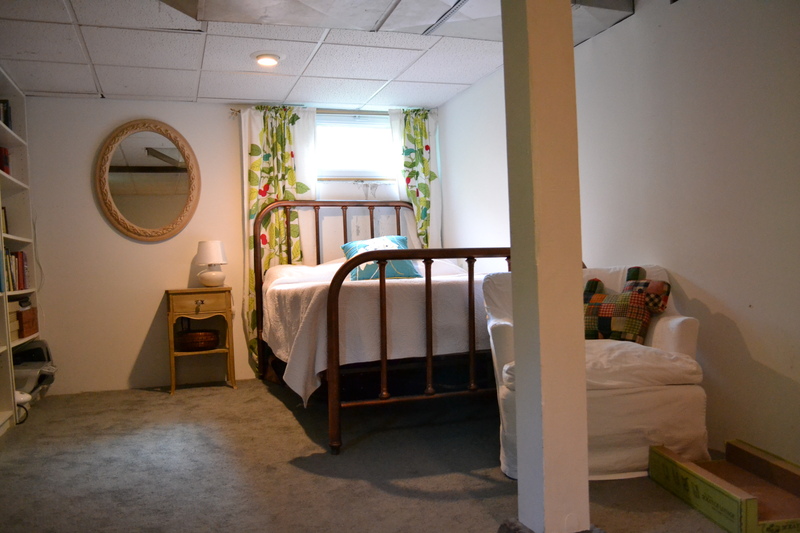 I dealt with the fleas (boxes and boxes of Borax to dessicate their nasty little selves), replaced damp remnants of Berber carpeting with clean wall-to-wall carpeting, painted, had the electrical fixtures upgraded, moved some furniture in and kind of gave up. A couple of years ago, I finally dealt with some of the hodgepodge by replacing my insufficient folding bookshelves with tall, white Ikea ones. Then I kind of gave up. Again. 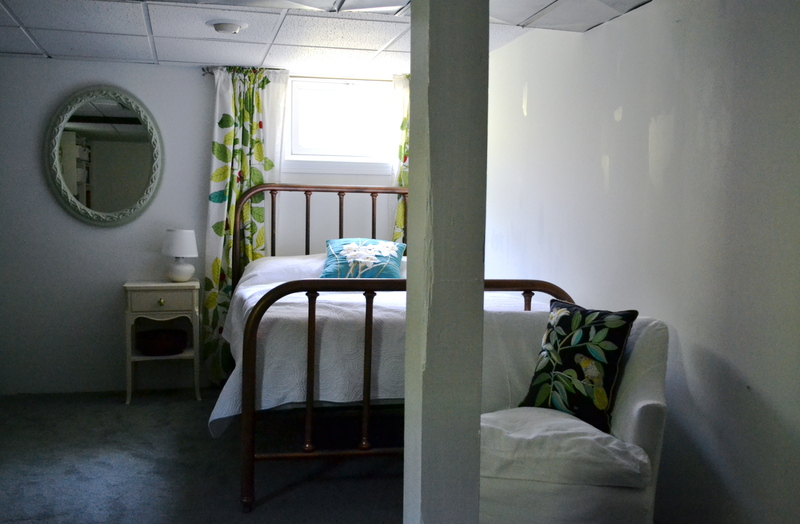 Last week, I showed you what the room looked like after I moved the piano out into the unfinished half of the basement and got a new bed. That major change made a few of the more minor ones finally seem possible: spackling and touching up the drywall under the window where a cat caused some major damage, adding window trim, putting on outlet covers that have been in the garage for five years, and painting the nightstand and the mirror, both of which came to me—at different times—in an odd, antiqued olive green. 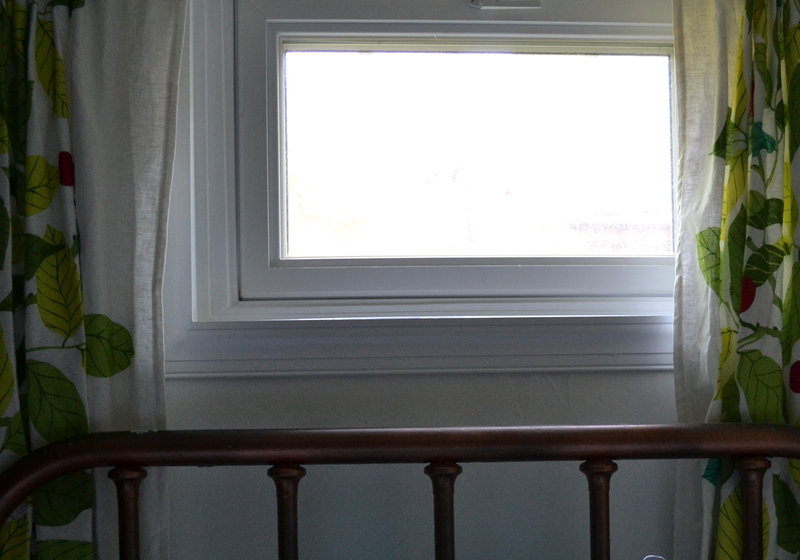 I’ve painted dressers and mirrors before, but adding trim and framing in a window was something new to me. I’m sure I didn’t really do it “right,” but if there’s anything I’ve learned from five years of homeownership, it’s that there are varying levels of right-ness in any project. 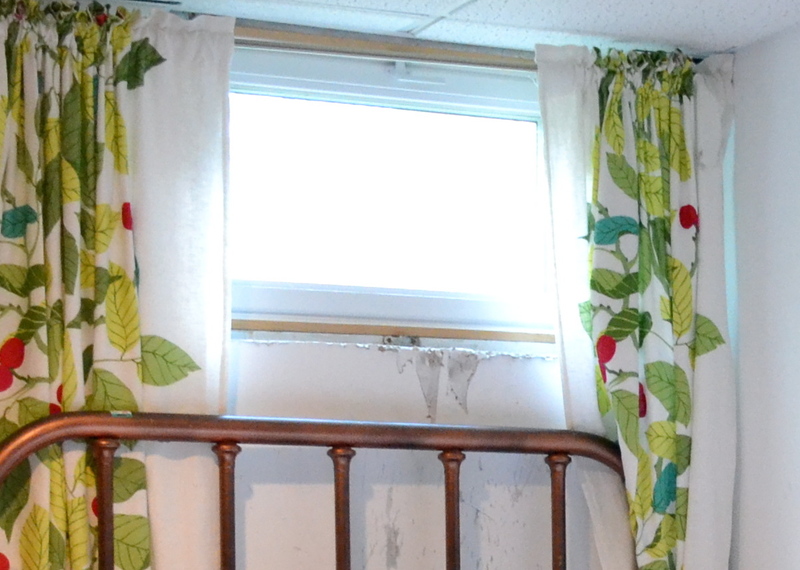 I bought a bunch of scrap trim at the Habitat for Humanity ReStore and just started cutting pieces and fitting them together inside and around the window frame. Sometimes done is good enough. 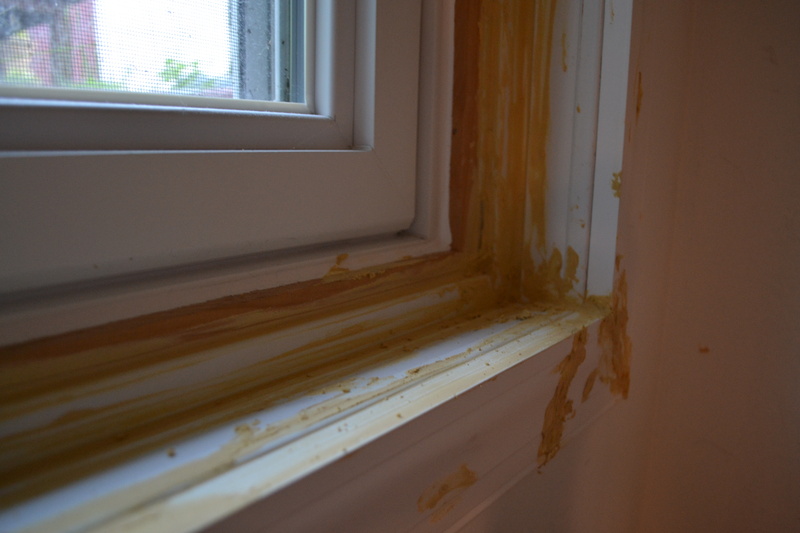 And there’s always wood putty to fix the things that happen when you’re not really sure how to use a miter box. Glossy white paint will also distract from all manner of sins, especially when you’re used to staring at bare concrete, cobwebs, and flaking drywall. The nightstand matches the painted dresser in my bedroom, but I’ve never had room for it there and feared that the custom-tinted paint—which has spent five Wisconsin winters in the garage—would, by now, be unusable. But, miraculously, it wasn’t, so now they finally match—except that I used this hilarious turtle knob on the nightstand and glass ones one the dresser. I painted the mirror with “Celery” spray paint. I now want everything in my house to be this color. I may have to settle for an ugly table that is currently holding up some flowerpots in the garage. So, things are much improved. Except that I got a little carried away and accidentally touched up the flat paint on the walls with what turned out to be semi-gloss. Win some, lose some. The turtle is really cute and the room is charming. Impressive. Your grandfather will love this. Grandpa is reminded of an elderly Scottish pattern-maker who said in heavily accented English that a “ittle bit” of putty and a “ittle bit” of paint will make a damn bad pattern look like what it ain’t. You say you want everything in your house to be that celery color. My house IS that celery color. This is not a desirable situation.